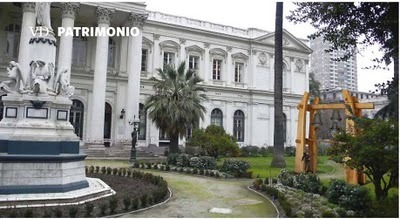 Cazu Zegers the architect was commissioned to design the structure that will support the church bells of the Jesuit Church of the Society of Jesus, which after 150 years of being in a church in Wales, returned to Chile for display in the Plaza of the Constitution. They will then return to their original location, which is now the gardens of the former church. The bells were more than three months aboard a ship of the Royal Navy, travelling from Wales to Valparaiso, on their journey back to Chile after 146 years. They are all that remained of the Jesuit Church of the Society of Jesus completely burned December 8, 1863, killing two thousand and five hundred people which resulted in the subsequent creation of the First Company of Santiago Fire Fighters. The four pillars of the structure will be worked with axe as a tribute to the services of our ancestors. Graham Vivian was the merchant who bought the bells after the tragedy, in order to take them to Swansea, Wales. However, his brother realized how valuable they were and took them to the church of All Saints Oystermouth, where they were from 1864. That is until last year, when the Chilean filmmaker Pedro Pablo Cabrera discovered the source of these and the significant heritage they had. Then the Foreign Ministry began the paperwork for the bells to be returned to the country. After February 27, the Anglican community unanimously decided to donate the bells to Chile as a way to remember the victims of the fire and the recent earthquake and tsunami. Considering its 900 kilos, and the nature of the memorial, the architect designed a support of Oregon pine, based on four pillars of six feet high, each characterizing an attribute: disaster, solidarity, heroism and reconciliation. "We are fragile and we forget very quickly, but we also have a number of qualities, and those are shown about this structure," says Cazu, who after this conceptualisation asked the artist Jessica Torres to take charge of its assembly in the workshop of sculpture of University of Finis Terrae. 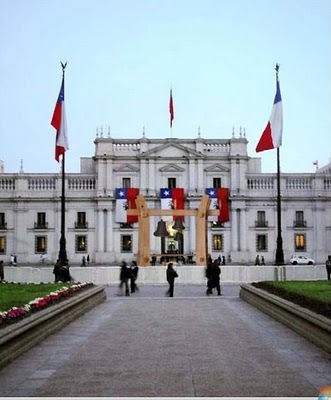 In addition, as president of the Foundation Lastarria Observatory, architect and cultural director Miguel Laborde, a peal of bells proposed by Chilean artists, will be made in four churches of the city centre between 4:30 and 5:30 am on September 29 to recreate the soundscape of 1863. This will be recorded and played on the same day, at the time of opening.